Tourism Cabinet Secretary Najib Balala has dismissed calls for his resignation following the death of 10 rhinos at Tsavo East National Park. Mr Balala Monday said those calling for his resignation "can go to hell" adding that he will not be intimidated by their "side shows". "In my leadership, I decided that I am going to be right and not nice. On the issue of rhinos, I am going to stand with what is right. Nobody has appointed me; it is President Uhuru Kenyatta who appointed me, so they can go to hell. I can tell them that," Mr Balala said at Mombasa Governor Hassan Joho's office when he paid him a courtesy call. Mr Balala reiterated that it is President Kenyatta who can decide his fate as "he is the only one who has appointed me here and he knows I have the capacity to run the wildlife docket and nobody is going to intimidate me." The CS said those calling for his resignation were people with an agenda of destroying the Kenya Wildlife Service. "They want to do that so that they can take over the parks and start using emotions of international people to raise funds for their lifestyle that is not accountable in this country but I am going to stop it once and for all," said the CS. 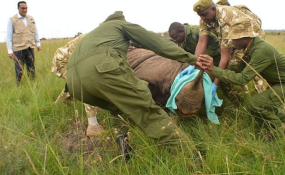 There has been calls for Mr Balala to quit after the 10 rhinos died weeks after being relocated from Nakuru to Tsavo East National Park. He made the remarks an hour after National Assembly's Environment and Natural Resources Committee summoned him to explain how the rhinos died at the park. Mr Balala has absolved the ministry from blame, arguing that a fully autonomous technical team was responsible for the programme. The CS instead suspended six senior officials in charge of the relocation and demoted KWS Director-General Julius Kimani on Thursday, it was the climax of the fiasco. Those suspended are Dr Samuel Kasiki who was in charge of biodiversity and research, Mr Francis Gakuya who headed veterinary and capture services, Dr Isaac Leekolol who was head of capture services, Tsavo East senior warden Felix Mwangagi, Dr Mohammed Omar who was in charge of ecological and monitoring services and Mr Frederick Odock, a senior scientist.